LAOISM: Where Did Lao Tzu Go Afterward? Where Did Lao Zi Go Afterward? According to legend, after the completion of the Tao Te Ching and couplet and before his departure from the Han Gu Pass, Lao Zi told Yin Xi to meet him in Sichuan Province one thousand days hence. When the time approached, Lao Zi's spirit transmitted itself into that of a baby boy in a Lee family, by tranforming his green dragon into a green sheep that would accompany him daily. One day, this green sheep suddenly disappeared, and the Lee family searched everywhere in horror of what they might find. Fortunately, Yin Xi happened to be passing by at that time and saw the little boy with the green sheep. He instructed him to go to the Lee family with the message that Yin Xi was arriving. As soon as this baby boy heard the news, his body turned into a giant spiritual being. Laughing at Yin Xi, Lao Zi acknowledged that Yin had sucessfully cultivated himself into the body of the Tao. 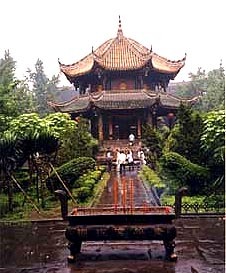 Nowadays, there exists a temple in Chendu called Qi-Yang-Gong, or Green-Sheep-Temple. [pictured right] This is one version of the story that green always signifies something mystic in Taoist legendary literature. Following this, Lao Zi continuously reincarnated into human forms. Some Taoists believe Lao Zi to be the spiritual body of Buddha. According to Hua Hujing [Scripture on the Conversion of the Barbarians -- preserved in Donghuang Caves], Lao Zi continued his wanderings through Central and Southern Asia after passing through the Han Gu Pass. His teaching influenced Buddhism, the person of Confucius, and even Christianity in Mani. After Yin Xi, He Shang Gong (man-on-the-riverside) became the first spiritual interpreter of the Tao Te Ching. According to one version of Taoist literature, he was himself a reincarnation of Lao Zi. He Shang Gong compiled the two volumes of Tao and Te into one book embodying 81 chapters, representing double yang or double 9. He created a title for each chapter, as well.